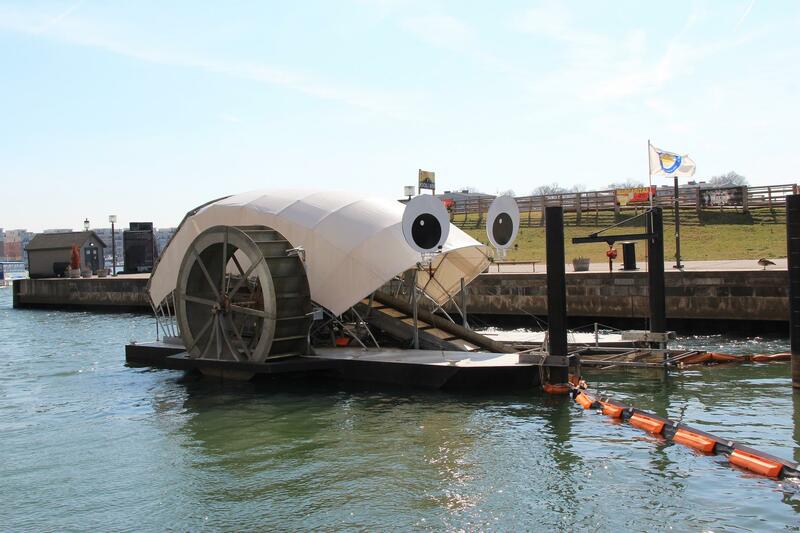 Mr. Trash Wheel is a water-driven trash-interceptor and collection machine that was installed four years ago at the mouth of the Jones Falls, where it empties into Baltimore’s Inner Harbor. It was invented by Baltimore entrepreneur John Kellett and has succeeded in collecting more than 1.5 million pounds of garbage over the years. It has also collected a large social media following, with 30,000 followers on Twitter, Facebook and Instagram. Adam Lindquist is director of the healthy harbor initiative of the Waterfront Partnership, which owns Mr. Trash Wheel. I asked: are you planning another? Lindquist: "The fandom behind Mr. Trash Wheel has been so supportive. It actually allowed us to crowd fund a second trash wheel, which we installed in Canton in 2016. We call her Professor Trash Wheel. And right now, the Maryland Port Administration is in the process of installing a third trash wheel, which they call Captain Trash Wheel." Mr. Trash Wheel has become a cult figure in Baltimore, so much so that he’s even inspired his own song. It was written by Jonathan Jensen, a bassist for the Baltimore Symphony Orchestra. Jensen: "Well, last year the Peabody Heights Brewery introduced a new beer called 'Mr. Trash Wheel’s Lost Python Ale.' And at the launch party, they had a band performing– my friends in the Tongue in Cheek Jazz Band. And I thought: ‘What a perfect time to introduce a song celebrating Mr. Trash Wheel.'" Okay, let’s sing it. We have Jonathan on ukulele, Zach Serleth on guitar, and Bridget Cimino on vocals. For the strangest find by far. He’s the hero of the harbor in Baltimore! For more than a quarter century, the Bay Journal has been a respected voice on the Chesapeake Bay cleanup effort, funded in part through grants from the Environmental Protection Agency. Then last spring, the journal published stories about the Trump Administration’s proposed deep cuts to EPA and how they would damage the Chesapeake Bay cleanup. In response, a political appointee in the Trump Administration decided that EPA’s $325,000 annual payments to the Bay Journal would be abruptly terminated in the second year of a six-year contract. The Trump appointee, John Konkus, said: “the American people have major concerns with newspapers and the media,” according to a report by Greenwire. And so Konkus, an EPA communications official who also works as a media consultant for Republican political campaigns, saw no reason for EPA to keep funding the Bay Journal. In a Senate committee hearing, Maryland Senator Ben Cardin, a Democrat, grilled EPA Administrator Scott Pruitt about what appeared to be a politically motivated attack on the freedom of the press. Chlorpyrifos is a common insecticide sprayed on fruits, vegetables and golf courses around the world since the 1960s, but increasingly linked by scientists to brain damage and developmental problems in children. After being petitioned by public health organizations, scientists at the U.S. Environmental Protection Agency in November 2016 -- at the end of the Obama Administration – recommended a ban for chlorpyrifos because of these health concerns. But as one of his first acts as the Trump Administration’s Administrator of EPA, Scott Pruitt in March 2017 overruled his scientists and allowed manufacturer Dow Agro Sciences to continue to sell the pesticide. In Maryland, state Delegate Dana Stein, Vice-Chair of the House Environment and Transportation Committee, recently worked with colleagues to introduce legislation that would counteract the decision of the Trump Administration and ban chlorpyrifos in Maryland.